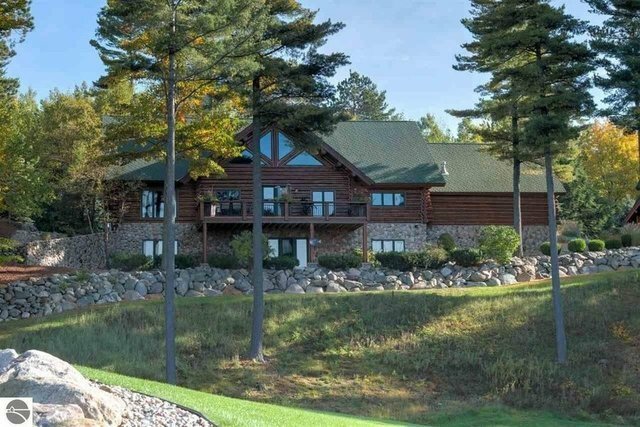 Spectacular custom, fully furnished Log Home w/stunning views of Lake Michigan, nestled high on 21.26 rolling, wooded acres that extends to M-22 (a designated “National Scenic Drive”) is meant for entertaining both inside and out. Now includes a 100ft of direct Portgage Lake frontage just minute from this 3,504 sq. ft. log home is an exquisite show case of architectural design with fine authentic handcrafted built-ins. Guests arrive under a portico, sheltered from the elements, to an open and spacious floor plan with a natural stone fireplace and vaulted ceilings. Master suite includes glass block shower and claw foot tub. 2nd bath has steam shower and sauna. Upper level is an open loft with seating and sleeping areas. Walk-out lower level offers a natural stone fireplace in family room, bathroom and 2 bedrooms, one which sleeps 6. Home features hot water heating system, air conditioner, generator and high speed internet. The attached 2 car garage is heated and has radiant heated floors. An extra bonus is the 3,540 sq. ft. media/dance/exercise building equipped with its own hot water heating system and air conditioning. The state-of-the-art theater room seats 12 and upper level offers guest quarters. Highlights of this property include extensive stone landscaping and sprinkling system. A custom stone outdoor kitchen and dining area for entertaining large groups is complete with sound system and bonfire area. Detached 30’ x 40’ heated garage/work shop has a 17’ door to accommodate large boats. To the right of this building are trails that lead to M-22 and to the right of this trail is a large cement storage pad. A gentle stroll down a lit stone trail brings you to a surprising end at a $100,000 heated “Tree house” that sleeps 5. This stunning compound is only minutes from Arcadia Bluffs Golf Course and Crystal Mountain Golf/Ski Resort & Spa.